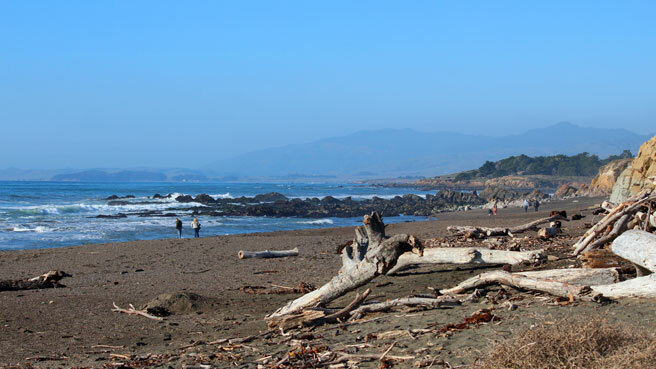 The dark, coarse sand and driftwood on Moonstone Beach draw a distinguishing line between Nor Cal and So Cal beaches. The bluffs get jagged near Moonstone Beach and beaches are not so easily accessed, especially with a baby or toddler. However, the antique stores and galleries of Cambria can be a nice stopping point on your way up or down the coast. Atmosphere: The small town of Cambria is set on pine-covered hillsides looking over the ocean. Tourists come here for the solitude and secret feel of a Moonstone Beach bed and breakfast, or for a base from which to explore Hearst Castle. Parking and Entrance: Park along Moonstone Beach Drive or in one of the beach parking lots. Access is usually down a steep flight of stairs. The Santa Rosa Creek lot leads to one of the more sandy areas. Be sure to check water quality and surf advisories before getting in the water. Nice Walks and Views: Take the stroller along the narrow wooden boardwalk on the top of the bluff for great views of the rocks and wild sea below. There are galleries, restaurants and hotels along Moonstone Beach Drive and an old-time village a bit inland on Main Street. Activities for Toddlers: Your toddler will love the seaweed, moonstones, shells and driftwood on this beach. She could spend hours here just studying the material strewn across the sand, and you’ll also be thrilled with searching for the namesake moonstones. There are some tidepools too, if your toddler is careful enough for such a thing. Shamel Park, just south of Moonstone Beach, has a playground and a picnic area. Bathrooms: Bathrooms are in several locations near parking areas. There are no bathrooms at beach level. Perks for Parents: Cambria is quiet, and offers the kind of solitude found at a retreat. Taking your baby here means a little less silence, but the geography of the beach will replenish your soul after a hectic first year. Where to Stay with Kids: A deluxe continental breakfast with waffles and afternoon tea and cookies are just a few of the family-friendly amenities available at the Sand Pebbles Inn. They specifically cater to families, unlike some of the other “romantic” bed and breakfasts in the area. Baby-friendly Restaurants: If you’re in a berry mood, stop at Linn’s Easy as Pie Café off Main Street to sample their delicious ollalieberry pie and chicken pot pie. Cute garden patio and easy ordering. What Else to Do: Hearst Castle is not really baby-friendly with its bus ride up to the mansion, long tours and precious items throughout. That said, if baby is a good sleeper or not mobile and typically well-mannered, it’s worth the trip to see the Neptune Pool and Roman Pool. Pretend you are one of Hearst’s favored summer guests about to jump from the balcony of the gold-bottomed Roman Pool. Further north, your toddler can witness a match between snarling elephant seals at Piedras Blancas. Show him the babies laying with mama and the daddies lumbering into the ocean. Check Friends of the Elephant Seal to see what’s happening there before making the drive.